Here are some more fun and simple scrapbook pages from my Scrapbook in a Day class (using the Sunshine Garden Simply Scrappin' Kit). To see more pages click here. 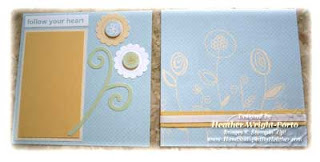 These pages have the yellow 6x6 square as a 1st layer and then a 5.75 square adhered as the 2nd layer. 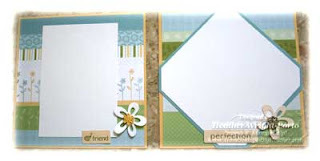 On the LEFT, just a single layer Whisper White photo mat (or journaling box) is used, with a small sticker greeting, and flower with Filigree Designer Brads used (and raised with Stampin' Dimensionals). On the RIGHT, I used squares in blue and white, rotated them to make the diamond shape and trimmed them manually and separately before adhering. Again a small greeting was used at the bottom, center and the same type of flower as on the left side. These were fun pages and something a little different. I used a bowl to trace the circle on the designer series paper and then cut it off-centered (using the table top cutter). Then manually cut the circle. On each side I placed border stickers and aligned them. On the LEFT, I added 3 decoratve stickers to the bottom left. Also there is a layered mat in the upper left corner. On the RIGHT, again I used one of the floral stickers that is part of the kit and also punched Whisper White flowers using the Boho Blossoms punch. Then I added small, clear rhinestone brads to the center. 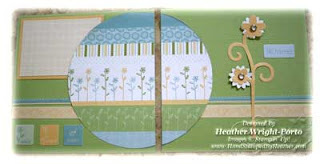 Lastly, I used Stampin' Dimensionals to give the flower-heads a raised appearance. These pages were quick and easy! On the LEFT side, there is a sticker/greeting at the top left, a double-layered photo mat on the left, as well as floral stickers to the right. Stampin' Dimensionals were used to "raise" the center of the flowers (which are stickers as well - all part of the Simply Scrappin' Kit). On the RIGHT, I simply wrapped 2 different ribbons around the 6x6 square.